A large spider (adults are 10 to 15 mm in length) shaped a bit like a short cigar with quite long and robust legs. When resting, the front pairs of legs are typically held outstretched and close together to the front. 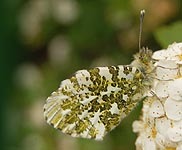 Body colour is variable but the front segment of the body almost always has a darker central band with a thin white or yellow line down the middle. Adults tend to occur in tall vegetation in places such as rough grassland, woodland rides, heathland and marsh edges. Wolf spiders have an egg sac which they carry attached to their spinnerets at the end of their abdomen (cf. Nurseryweb spiders below), and are most often found running over the ground. Silk tents with a more open structure and containing spiderlings with distinctive, round, yellow abdomens marked with a dark, backward-pointing triangle, belong to orb-weaving spiders. 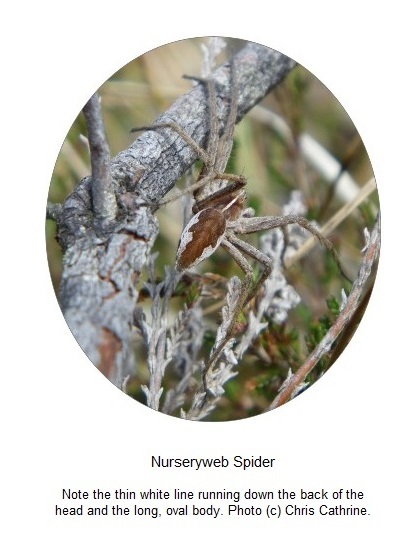 The Nurseryweb Spider is most abundant in the south of the UK. There are scattered records throughout Scotland, but very few from southern Scottish regions. 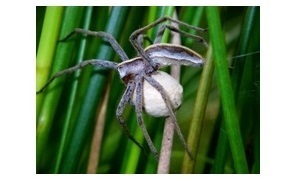 In summer, the female carries her whitish egg sac under the front of her body, held firmly in the mouthparts (cf. Wolf Spiders above). Before the young spiders hatch, the mother constructs her nursery - a conspicuous, dense silk tent, built amongst strong vegetation. Once her young hatch she is usually found on guard on the outside the tent while the cluster of spiderlings rest inside. More information about this spider can be found here.